Emmylou has a new hobby and Åsa is not happy about it at all. Actually, it’s not the hobby she objects to, it’s Emmylou’s obsession. It all started a month or two ago. Emmylou was standing in the shallow water of the bay we walk around every day, when a little fish swam up right between her paws. Emmylou couldn’t believe it. She pounced and missed but she was hooked. She started spending lots of time standing by the water on rocks, or in shallow water on the beaches, watching for fish. At first we didn’t mind. It was very hot, too hot for me to walk much. We would go down to the park at sunset, and Åsa and I would sit on the grass hoping to catch a cool breeze, while Emmylou stood on the rocks below us, watching for fish. She didn’t want to walk, she just wanted to stand there, and I didn’t mind at all. She looked pretty good, too, with her tail stuck straight out, and her body poised to pounce. Once Åsa timed her: in half an hour she hardly moved a muscle, except for her head as she scanned the shallow water. People would gather and marvel at her. It was like Emmylou had gone into a trance. When Åsa climbed down the sea wall and put her leash on, Emmylou would snap out of it and leap up the wall without a backward glance. But then she started to get really serious about it. When Åsa let her off the leash after we got to the park, Emmylou would run as fast as she could, and that is pretty fast, to her first fish-watching spot. Her walk started to consist of running from fish-watching spot to fish-watching spot. She stopped playing with her pals. Poor Kayla would bound up to Emmylou as she stood watching fish, but Emmy would just give her the cold shoulder. It all came to a head two weeks ago. Emmylou stopped coming when she was called, when she was fish watching. Worse, she actually ran away from Åsa when she tried to catch her. One evening when she was watching fish at the bottom of the seawall, she ran away from Åsa along the narrow strip of sand that was covered with oysters. 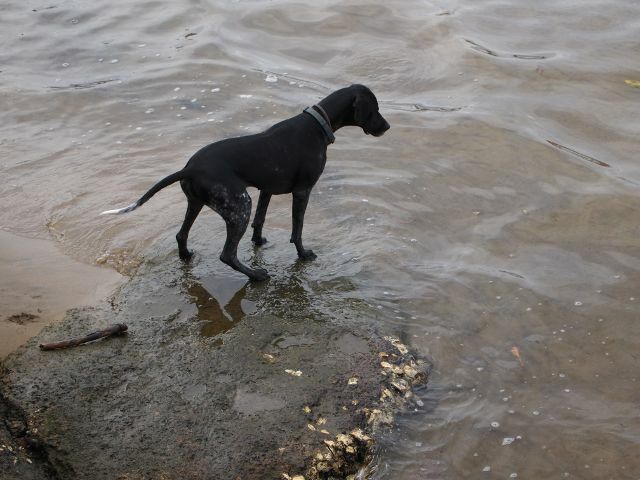 Emmylou waded into the water and Åsa turned back, thinking Emmylou would follow. She didn’t. We waited for ages and she did not come. So Åsa climbed down the seawall again, and finally caught her. They had to walk over slippery rocks and Emmylou was pulling like crazy on the leash. Åsa told her to stop pulling and warned that if she fell over and hurt herself it could be a long time before she got another walk. But Emmylou didn’t listen, she never does. So Åsa got out the halter her sister in law sent her, and on it went. There was no more fish-watching allowed for a while. I have to say Emmylou took it all pretty well, though she did strain every time we went near the water. Then she was allowed little bursts of fish watching, but only on the beach and never on the oystery sand and slippery rocks. If Emmylou came back when she was called she was allowed to watch again. If not, when Åsa caught her it was on with the halter. They also started going to agility again. I must say I was surprised at that. I mean Emmylou loves, loves, loves agility and I thought she was being rewarded for being naughty. But Åsa thinks it gives her something more challenging to think about, and I suppose there is something in that. She is a very obsessive dog, and apparently that is part of her breed. Åsa heard of someone whose German-shorthaired pointer could be bodily picked up and carried away, and even then she kept pointing. I imagined us walking back home, carrying Emmylou rigid in her pointing pose, and couldn’t stop chuckling to myself. In fact I think it is all very funny. I think Åsa is just about as obsessed with Emmylou’s fish-watching obsession as Emmylou is with fish, if you know what I mean. I don’t mind it all. It just means having Åsa all to myself as we lie in the grass and let Emmylou entertain passers-by as she poses on the rocks, or points at the water. It sure beats being dragged all over the park by a hyperactive dog. Now that I am old, a short stroll and quiet lie down and tummy rub, without Emmylou pushing in, is my idea of a really good walk. As far as I am concerned, she can watch all the fish she likes, as long as Åsa keeps patting and tickling and talking quietly to me, as I lie in the shade on the grass next to her. This entry was posted on Friday, March 25th, 2011 at 2:22 pm and is filed under Zac and Clancy's page. You can follow any responses to this entry through the RSS 2.0 feed. Both comments and pings are currently closed.